„Jeans for refugees “ is a global project with aim of providing help to refugees around the world. The project is the idea of the legendary fashion designer and artist Johny Dar. 100 celebrities from the world of film, fashion, art and music joined the project by donating jeans, including: Ryan Gosling, Victoria Beckham, Daniel Radcliffe, Sir Elton John, Anna Wintour, Claudia Schiffer, Dannii Minogue, Emma Watson, Eva Longoria, Florence Welch, Heather Graham, Cate Moss, Lily Allen, Pink, Rachel Mc Addams and Sharon Stone. Dar hand-painted donated jeans turning each pair into a piece of artwork. From July 22, this jeans collection has been officially available at auction on website www.catawiki.com/jeansforrefugees which will last until October 30. Raised funds will be given to the organization International Rescue Committee and will help financing initiatives of this organization which every day helps millions of refugees around the world, including Serbia. In response to the greatest humanitarian crisis of our time, Dar wanted to draw public attention to the problems faced by those who are forced to leave their homes, and with the support of world celebrities and individual organizations, his mission has evolved into a global campaign and touched hearts of people around the world. “The refugee crisis has affected all of us – touched all of us and got us all worried. The concept behind the project “Jeans for Refugees” is to send a message through the arts, to make a positive change and empower people to work together with a common goal to make the world a better place to live in, “explained Johny Dar. Dar will also hand-paint jeans for 10 days in a refugee camp, to show persistence and determination required by millions of refugees who want to complete their journey and fulfil their joint dream of a new home and a new beginning. Dar hopes that painting jeans in a refugee camp, will brighten the time spent in the camp for a moment, and also raise awareness about the campaign around the world. “The funds raised will help the International Committee to support refugees around the world, from the first time they were forced to leave their homes, to the relocation and integration into new communities. Refugees are strong, durable and valuable people who had experienced terrible things, but still has a lot to offer. We are grateful to Johny Dar and honoured to have so many high profile people lending their support and standing in solidarity with refugees.” commented Sanjayan Srikanthan, Vice President Europe at the International Rescue Committee. 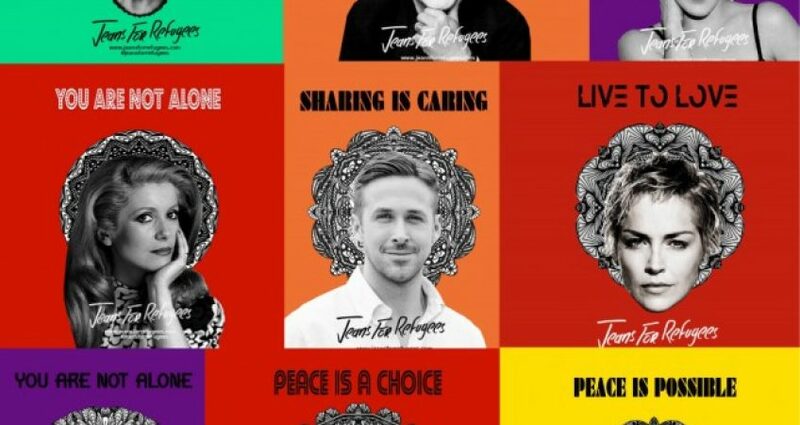 The project “Jeans for Refugees” will be completed by jeans exhibition at the Saatchi Gallery in London, and the gala dinner on the last day of auction. Johny Dar is an artist pioneering an original form of artistic expression through painting, illustration, fashion, design, body art, multimedia, and music. He is passionate about breaking boundaries, realising dreams, making the impossible possible. Johny Dar’s artistic work inspires and invites audiences to experience a new renaissance of expression and experience. The International Rescue Committee responds to the world’s worst humanitarian crises and helps recovery of health, safety, education, economic prosperity and power of people whose lives were shattered by conflict. It was founded in 1933 upon initiative by Albert Einstein and operates in more than 40 countries around the world helping people to survive, gain control of their future and strengthen their communities. Catawiki is Europe’s fastest growing online auction house. Originally founded as a community for collectors in 2008, Catawiki has since become the number one website for buying and selling extraordinary items. Since 2011, Catawiki has been hosting weekly auctions, now in over 80 different categories, including art, fashion, jewellery, watches and memorabilia and all auctions are curated and supervised by specialist auctioneers. For more information, visit www.catawiki.com/jeansforrefugees.